Cannes hotels selling out. Book now! 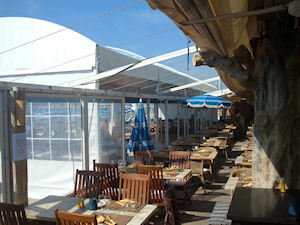 It's the oldest beach-restaurant in Cannes, installed here for the last 50 years and run by the Rotondaro family. The location is excellent, right in the center of La Croisette. The interior portion is air-conditioned in summer and heated in winter. Waist-watchers will appreciate the special diet dishes on the menu and the beach is divided into kids and kid-free zones.